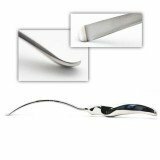 Like dissectors and elevators, the surgical spreaders commonly used in endoscopic brow lift procedures feature curved shafts and ergonomic handles. If you don't see the spreader that you are looking for, contact us. We can reference any product number from any company.